www.kyairhog.com: Here's a little one-nighter we took on 9/18 (I think). Here's a little one-nighter we took on 9/18 (I think). 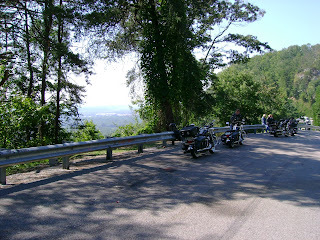 This is usually our first stop (we refer to it as Spring City Bluff just out of Crossville, Tn.) when we're headed for Tellico Plains and the Cherohala... actually this was my first and last picture stop on this trip. We met a few here from Cookeville headed for Gatlinburg... ran into them again several hours later at Tellico Plains at the Cherohala Market. Beginning right there is what you ride all day for! Click on any picture for large hi-res image, the go "back".